Forget waterproof pants, expedition boots and woollen beanies – read on to discover the REAL must-pack items for your expedition to the White Continent. It is often said that the only thing you really need for an unforgettable Antarctic expedition is an adventurous spirit but, let’s be honest here, a pair of top-quality thermals wouldn’t go to waste. Although today’s topic will not cover the most essential items you should pack for your trip to Antarctica (you’ll find those on our Packing Tips for Antarctica blog) it will cover those other items, the ones some people say you don’t really need. But who wants that kind of negativity in life?! Take these genius items along for the Antarctica adventure of a lifetime and you’ll surely agree with us: these are the must-pack items no Antarctic explorer should do without! If there’s a single item of clothing that epitomises the ‘travel hack’ ideal, it would have to be the new AyeGear H11 hoodie. Pack this all-you’ll-ever-need fleece in your Antarctica-bound suitcase and you’ll (barely) need anything else: 11 separate compartments in sorts of sizes (passport to the left, meds to the right), genially convenient (you can seriously just wear your hand-luggage) not to mention the fact that it’s comfortable and super warm (rather pivotal considerations for adventures in Antarctica) and, in case you hadn’t noticed, trendy as anything you’d see on a catwalk. We first fell in love with the H11’s predecessor (the H13) and between the two, we know you’ll find your ideal travel match. Keep in mind that the release of the H11 has decreased the price of the H13, a model that comes with two extra compartments, not to mention a greater colour choice. Whichever AyeGear hoodie you choose, you’re guaranteed to be the coolest and best-packed guest on the ship. Here’s an item that appears to be a luxury but is actually a near-necessity on Antarctic expeditions, especially when travelling as a couple. Yes, you’ll get a great-enough view on your camera zoom but what if you’re not the one holding the camera? Must you just wait your turn? No need for domestics on board your Antarctica expedition ship when you pack a pair of lightweight binoculars. Contrary to what many packing guides will attest, a great pair of binoculars do not have to cost a fortune, unless you’ve got a safari in Africa coming up or are expecting to discover a newfound love of birds – in which case, you may want to invest a little more. For travel to Antarctica, however, we do love everything about the Olympos DPSI 8 x 40: it’s affordable, has a great grip, offers awesome views, has UV-protection (from that glaring Antarctic sun) and is exceptionally practical for travelling. It may surprise you to know that dehydration, in the vast icy land of the south, is arguably the biggest problem for most Antarctic expedition guests. There’s so much going on, every single day, that one easily forgets to gulp 2lt of water – the cold temperatures not doing much to remind you to stay hydrated. Skip the single-use plastic nonsense and pack a durable, spill-proof 750ml beauty, like the CamelBak Eddy. No soggy socks in your backpack and no need to collect ice and snow on shores: just take Eddy along for the adventure. Much like dehydration, sunburn and even heatstroke are not that uncommon on expeditions to Antarctica, a place where UV rays are at their most potent. The Australian Antarctic Division even did a study on this sneaky issue among scientific researchers, surmising that sunblock is actually of pivotal importance to anyone heading to the region. Granted, the study may have been carried out on scientists yet head here in the height of the Austral summer and you too could be exposed to harmful UV rays for hours on end, every single day. Luckily, the solution is as easy as (you know it) slip, slop, slap! The slapping should be of a sunscreen with an SPF factor of 30 (as a minimum) and, to counteract all that sea spray on Zodiac outings, be water resistant as well. We love the Neutrogena Broad Spectrum SPF 50+ sunscreen stick because it allows you to reapply without taking off your gloves. Win-win! 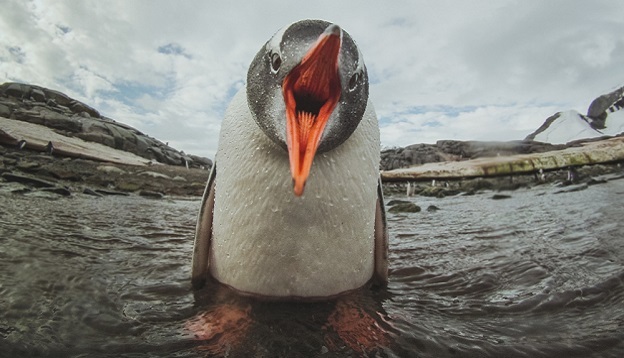 Given the quality of photos taken by our modern mobile phones nowadays, the GoPro appears to be so 5 minutes ago but when talking about a simple ‘point and shoot’ (as opposed to a semi-professional DSLR) they still rule the roost on Antarctic expeditions. Waterproof, crash proof (probably even elephant seal proof) the GoPro just gets the job done whilst simultaneously not getting in the way of a good time – or in this case, a kayaking outing in Antarctica. Wonderful stability and a versatile array of accessories allow you the freedom to move around and explore unencumbered. This clever gadget predicts your next move, stores live-feed videos, captures 12MP photos and features voice control so, rather than fumble with your gear, you can simply yell at it to take a photo! Expedition ships can be rather noisy, the walls not being nearly as insulating as they are in hotels. Between the roaring of the engine and the rowdy folks who wake up far too early (or go to bed far too late), light sleepers would do well to pack earplugs in their luggage. More so if you suffer (or think you might) from seasickness: putting in some earplugs and lying down with your eyes closed greatly mitigates the ill-effects of the ship’s swaying. We like FlyFit because they’re ergonomically shaped (no ear ache if you sleep on your side), really filter out cabin noise and are very easy to clean. 100% POLAR fleece, warm as an Emperor. And we’re only half-joking. At Chimu Adventures, we love taking intrepid travellers on fantastic (and fun!) adventures to Antarctica. Why not come join us? 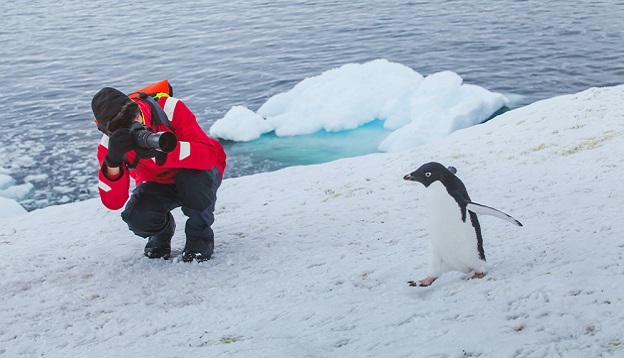 Check out our collection of Antarctica expeditions and give us a call when you’re ready. We’ll get our penguin onesies ready. Explore the most spectacular continent on Earth as you witness breathtaking landscapes and magnificent wildlife. Become part of a memorable voyage through narrow passages and even spend a night camped on the ice.